After a month touring the southern Italian regions of Puglia, Basilicata and Campania, and multiple earlier trips to the northern regions, I believe I have found possibly the worst accommodation in Italy. If the test is value for money, the answer is easily yes. Foolishly I ignored all the negative reviews when booking a three night stay erroneously assuming the writers were hard to please and relishing the opportunity to stay almost on the water in an historic 17th century palace immediately below the gorgeous village of Castellabate. On arrival things started well with little difficulty locating the uninviting prison like entrance gate next to the New Look salon and check in and introduction to the property by a thoroughly charming and enthusiastic Francesco. Initial impressions clinged to the hope that what we initially observed was shabby chic although the reality of the shame of the absolute degradation of the palace, facilities and grounds and long gone grandness became all too apparent. Every where you look, you see the former bones of something really special but now screaming for some investment in maintenance. Our room for three nights was a superior sea view room at a discounted pre paid nightly rate of in excess of €250. The positives were a generous size and a glorious furnished terrace with a sea view. Regrettably the long list of negatives overwhelmed any attributes. The furnishings weren’t grand in anyway and would embarrass most three star motels! The hard bed was two singles shoved together, the under sheet dirtied from a previous guest with something best not described, the shower dark cave like, amenities obviously reused and refilled. A coffee/tea tray with kettle was provided however after the first night no replacements were provided. So called “breakfast”was included in our room rate and put generously was a disgrace. The meagre offerings were of poor quality including for example juices tasted of diluted cordial, croissants were stale if not burnt, what was in a past life scrambled eggs were left cold in an unheated bain marie and the tasteless ham. I felt embarrassed for the lovely Indian waitress. The few redeeming features of the hotel include its undeniably superb location, beach club and ease of parking and generally workable wifi. In summary however I left the hotel angry with myself for not heeding the warnings and outraged by the owners cost cutting and utter neglect of what was obviously once an iconic Cilento treasure. Be warned. The Good The Palazzo: this is a beautiful building and the village of Santa Maria de Castellabate is perfectly placed with some lovely restaurants and a good local Italian feel. 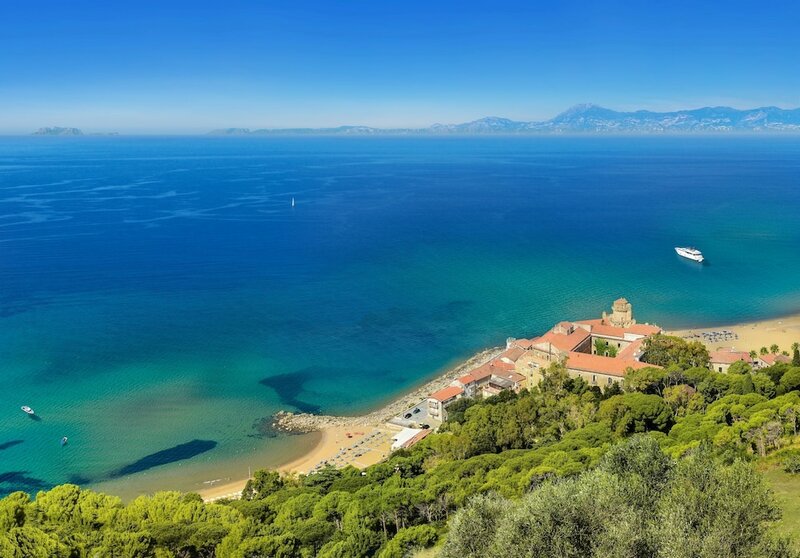 It is a place where lots of Italians go on holiday and although it is not super smart like the Amalfi coast, if you like a more authentic Italian experience then this area is much better. There are also excellent beaches with safe waters for swimming. The hotel restaurant: This is well sited with exquisite sunset views and excellent food. The service: The staff, especially the waiting staff, are lovely and do a great job despite being overworked due to there not being enough staff on duty. The duty managers/reception staff were very helpful and did their best to resolve complaints and problems. The Bad The breakfast: No better than 2 star standard. The breakfast room is an outdoor hut next to the pool, with no view and enclosed on three sides with little natural light and no other form of lighting so that the back of the eating area was dark. The food was basic and the ‘so called’ juice was dilute cordial: the ‘orange juice’ was a strange red/pink colour and tasted like no fruit that I know. They have the cheek to charge 5 euros for freshly squeezed orange juice and also charge for things like omelettes. The whole breakfast experience is a disappointment and despite complaints from many guests, including ourselves, there was no improvement throughout our 10 day stay. Breakfast feels like it is done on the cheap to keep costs down. It could easily be so much better if they had a more generous budget for food and drink (which given the price of the rooms, they should be able to manage). If they used the outdoor restaurant area instead of the ‘hut’ it would make a huge improvement on the breakfast experience. Beach towels: This was a running joke with guests and staff who were not to blame for the lack of beach towels but had to deal with the consequences. There was a one towel per person limit but it was not uncommon for there to be no towels left and on occasion we had to wait 15 - 20 mins for clean towels to arrive. Gardens: These have huge potential and there are some pleasant areas, mostly around the wedding party venue and the restaurant. Much of the rest is overgrown and poorly maintained. The Ugly The ‘garden villas’: these are made to look and sound lovely on the website but the truth is that they are not of a typical 4 star standard, which is what the hotel professes to be. By this, I mean that the rooms are simple and do not have a luxurious feel - more like a 3 star hotel, which is fine if you are paying 3 star prices! The first room we were put into was a garden suite which was the kind of room that felt like it was only used as a last resort when there are no other rooms available. Inside, there were no pictures on the walls and very little furniture, just a large almost empty room with white walls, a white tiled floor, some simple storage furniture, a small uncomfortable easy chair and a couple of old metal single beds joined together to make a double bed. There was no sea view from the terrace and the garden was just a lot of overgrown trees and shrubs blocking the view and light so that it felt dingy and damp. The small garden area in front of each room was simply a bare patch of earth with a few sick looking plants and weeds attempting to survive without water. On the whole, this hotel is nowhere near European 4 star standards. It is quaint, has character and charm and is well sited however these factors on their own do not justify the 4 star prices. The owner, who lives in the main Palazzo, appears to be keeping overheads as low as possible in order to maximise profits and is only investing the bare minimum in the hotel. This is obvious from a cursory look at TripAdvisor comments dating back to 2009 where many of the same criticisms are repeated and have simply been ignored. Palazzo Belmonte is a beautiful building on an outstanding setting. Private beach, beautiful pool and mostly attentive, helpful staff.BUT - I think they are rather resting on their laurels and it could be so much better. I planned our weeks stay on the strength of a Times newspaper review , as a Ruby anniversary treat. It was more than we usually pay but I thought my husband is worth it ! We stayed in one of the more modern blocks,in a seaview room with terrace -lovely situation, but the room was slightly damp, the internet intermittent , the bath waste didnt work and the loo was reluctant to flush. Not what one expects for a 300 E a night hotel. Our complaints were dealt with sympathetically by Gracia, but not much could be changed in a week. This is a shame, because with a little more attention to detail, the hotel could be amazing as the situation is so good and the building beautiful. The other problem was that as we had rain most evenings, there was no inside bar space - a shame when I am sure one of the many castle rooms could make a beautiful reception room . The village is only 10 minutes walk away and has lovely bars and restaurants, but not great when you have a thunderstorm, and it is sad that the hotel doesn't make more of itself. We have travelled a lot and stayed in many different types of hotels and we generally prefer places with character, charm and quirkiness to luxurious resorts. Therefore reading the reviews on Tripadvisor did not put us off staying at Palazzo Belmonte, but I wish they had. This is not a hotel, as several other reviews point out, but it is a poorly run B&B with hugely inflated rates. There is no correlation whatsoever between the price and quality / service. The location / setting is amazing, so I would usually overlook the fact that the overhead shower doesn’t work (only hand held shower while squatting in a bath tub), that taps leak, the air-con is very noisy and inefficient, Wifi is poor, the decor overall dull, dated and cheap (not charming or quirky). I probably wouldn’t mind that we are given the most basic / cheap breakfast with very mediocre coffee, served in a dark shed like area with plastic tables and chairs and no view. To add insult to injury, you even have to pay €5 for fresh orange juice and €8 for an omelette ! I really wouldn’t mind all that, IF we were paying B&B prices, of around 150€ a night for two people because the charming surroundings and beautiful setting by the beach would compensate. However, we paid €320 per night which makes the lack of service and overall poor quality shocking and quite frankly infuriating. We stayed on the fourth floor, which was a long hike up. No elevator. When you pay a premium room rate of €320 we find it reasonable to expect fresh orange juice at breakfast, a good quality continental and cooked breakfast and complimentary bottled water in the bedroom. We don’t expect having to pay extra for these ‘luxuries’. Nor do we expect to be charged extra for additional pool towels. Also, after swimming in the sea / pool, a conditioner is essential, which I had to go and buy myself as it is not supplied. Having said all this, the (few) staff are very smiley and friendly, and they actually seem a bit embarrassed to be ripping off the guests. More then anything else, we feel it is very sad that the place is so badly managed and maintained, while it could be a truly wonderful and magical place to stay. If only the owner was prepared to invest (money and a lot of TLC) in his ‘Palazzo’ (or halve his rates if he is unwilling to invest), I am sure the negative comments would disappear and guests would not feel ripped off. We spoke to other guests with the exactly the same complaints / view. The best thing about our stay was dinner at Osteria 1861 which is excellent and extremely good value, located immediately next door, but do book yourself because the hotel appears unable to do so. Having spent almost two weeks in various parts of the the region (Naples, Ischia, Sorrento) at various hotels, we were looking forward to a luxurious and relaxing end to the holiday. We were looking forward to an exclusive, luxurious and charming experience - well when you pay almost 400€ a night you expect certain minimum standards. Apart from a very nice location and property this place will leave you with nothing but dissatisfaction and disappointment. Room: We booked a superior sea view rooms with balcony. While the view is great (but you see a filtered view of the sea due to vegetation), and the balcony area quite large with sun beds and seats it is mostly unusable in summer due to lack of any shade. The towels covering the sun beds were dirty (dead insects that had also stained the white towels) and worn out. The main area of the room itself was very small and poorly built - it seemed like the tiles on the floor had been laid by an amateur - see photos; curtains and furniture look like they belong in a cheap motel; terrible quality pillows and a cheap bed frame. Bathroom area was very large and roomy but incredible warm despite being at the back of the room and with a barely functioning air conditioner (in the bathroom). There was nowhere to hang towels. Rust on the door hinges in the bathroom. The air conditioner in the room was very ineffective and looked a few decades old. There is nothing luxurious about this room. The room size on the website is misleading as it probably includes the bathroom and balcony. No water provided complimentary. Extremely cheap quality bathroom slippers in the room. Dead insects were found everywhere in the room and were only cleaned after we complained. Breakfast and dining options: Breakfast is a joke and a lot of other guest were appalled by it and complained and yet nothing was done about it. Breakfast is served in a shed like space next to the pool. It is not air conditioned and feels cheap (not rustic charm by any means). Buffet style breakfast with extremely limited choices spread on one table and of very poor quality. Poor quality packaged bread, old dry donuts, some croissants, a cake that didn't taste very good, boiled eggs, badly presented and overlooked scrambled eggs that no one ate and some juice that doesn't match the description - purple colored orange juice (?). Yes you can order some cooked breakfast for extra charges (e.g. 9€ for an omelette, 5€ for fresh orange juice instead of the purple concoction). This was an absolute joke. One waitress was trying and had a smile on her face and then other one looked surly and all she did was ask our room number every morning despite us being there for 4-nights. We ate dinner the first night at the hotel from their fixed menu - there is no restaurant - it is served in one of their lawns from where you can enjoy sunset. This was the highlight of our stay as the food was actually excellent and kudos to their chef (wish he also looked after the breakfast service). Hotel management should experience this appalling service while paying what guests pay to really appreciate how bad it is. Beach Website says they have a private beach. Totally false. The beach is the public beach in Santa Maria de Castellabatte and haves a small section that is roped off for guests of the Belmonte. Access is directly from the hotel grounds. Beach furniture such as the umbrellas and sun beds are at no extra cost thankfully but are worn out and also don't give you any sense of exclusivity or luxury for the price of the hotel. The paid facilities on either side of the roped off area had better quality beach furniture. The hotel should consider getting these people to operate the facility like professionals. You are allowed on towel per person per day according to reception and then you have to pay for extra towels or changing them but this is not really policed. If you want drinks you have to walk back up to the bar and order it and then they bring it down. Pool area We enter used the pool as the beach is nice and the water warm. However people with kids should note that the pool depth is not listed anywhere along the perimeter of the pool as you would expect. One end is quite deep. Staff Reception manager was a nice chap but the rest of the staff never smiled, never said hello and just went about in a business like way and didn't appear to be local Italians. The hotel is on a beautiful property but really let down by a desire to keep costs down, poor management with clearly no real experience of running a professional boutique hotel but charging guests rates that cannot be justified. We chose this hotel on the basis of a travel article in The Guardian which gushed about the hotel. I will be more careful next time to trust such false marketing. The reception manager was sympathetic to my feedback on checkout but clearly unable to do anything about it. I stayed with 14 members of my family at the associated Villa Sirena - 20 minutes by car. My parents and elder sister stayed at the hotel. A taxi brought them to us each day. My elderly parents threw a spanner in the works two weeks before our departure, as they required a wheelchair. We tried to change the room but unfortunately, due to the time of year, the hotel couldn't change the booking. The hotel is old and loved by its owner, a genuine Prince, who lives within a wing of the hotel. This hotel is not modern, it has a honest charm. The staff were really helpful and did everything to make my parents have a memorable stay - even offering to carry my father down the steps to the swimming pool each day and this hotel has a lot of steps. The beach is clean and the sea is crystal clear and very safe to swim in. Yes, WiFi is an issue but only for those that are mobile dependent. The hotel is so conveniently situated right in the heart of the very picturesque village of Sante Maria so eating out is really easy. The hotel reception will recommend and book restaurants on your behalf. And yes, we will be back. The heritage, the location, the buildings, huge potential. Booking online we found we had a standard room which although the bathroom was sparkling, the room itself was quite sparse, the bed extremely hard and the terrace looked on to a wall with the road on the other side. We paid to be upgraded to a similar room on the opposite side with a view of the sea and a more comfortable bed. WiFi a problem unless you were on the beach. The sea here not safe for children or cautious swimmers. Breakfast was available at extra cost and the reception staff although generally very helpful did not exactly encourage us to try what might be available in the evening. No problem there since there are so many cafes/restaurants to choose from just walking distance in Santa Maria. Palazzo Belmonte places you next to Church of Santa Maria a Mare and within a 3 miles (5 km) of Castello dell'Abate. This 51-room, 4-star hotel has a private beach along with an outdoor pool and free in-room WiFi. Guests can enjoy a flat-screen TV and stay connected with free WiFi. Beds are dressed in Frette Italian sheets and pillow menus, and the bathroom offers a hair dryer and free toiletries. Other standard amenities include a minibar, a safe, and a phone. Guests staying at Palazzo Belmonte enjoy access to a private beach, an outdoor pool, and a spa tub. You can take advantage of free parking, along with an airport shuttle (available 24 hours) for EUR 180 per vehicle one way. The front desk has multilingual staff that can help with tours or tickets, securing valuables, and luggage storage. Other amenities at this beach hotel include free WiFi in public areas, a conference center, and a 24-hour business center. The hotel has an outdoor pool and a spa tub. Other recreation options include a private beach. The preferred airport is Naples (NAP-Naples Intl.). The front desk is available during limited hours, and checking in and out are easy with express services. For convenient arrivals and departures, you can take advantage of the airport shuttle (available 24 hours), which is offered for a fee. Driving? This property offers free self parking, along with free extended parking. Reception hours are 10 AM -12 PM and 6 PM - 8 PM from January 28, 2019 to May 18, 2019. For more details, please contact the property using the information on the reservation confirmation received after booking. Breakfast is served in guestrooms from January 28, 2019 to May 18, 2019. For more details, please contact the property using the number provided on the booking confirmation email.